Mirza Ghalib (Urdu: غاؔلِب‎) – Urdu and Persian-language poet during the last years of the Mughal Empire. A distinguished Urdu and Persian poet, considered to be the last great poet of the Mughal era, Mirza Ghalib was born on 27 December 1797 in Kala Mahal, Agra into a family descended from Aibak Turks who moved to Samarkand (in modern-day Uzbekistan) after the downfall of the Seljuk kings. He was a prominent Urdu and Persian-language poet during the last years of the Mughal Empire. He used his pen-names of Ghalib (Urdu: غالِب, ġhālib means “dominant”) and Asad (Urdu: اسَد, Asad means “lion”). His honorific was Dabir-ul-Mulk, Najm-ud-Daula. During his lifetime the Mughals were eclipsed and displaced by the British and finally deposed following the defeat of the Indian rebellion of 1857, events that he described. Overcoming all odds that eclipsed his personal life, including losing his father as a child, facing financial constraints throughout his life, becoming alcoholic, violating norms, and even getting incarcerated, he stood out with his fascinating poetry, prose pieces, epistles, and diaries. The most remarkable poems of this literary master were in the forms of the “ghazal” (lyric), the “qaṣīdah” (panegyric) and the “mas̄navī” (moralistic or mystical parable). Struggling through penury and other adversities, he finally garnered recognition after being inducted as the poet laureate in the court of the last Mughal emperor of India, Bahādur Shāh II. His rich body of literary work has remained an inspiration for other poets and writers for generations and continues to touch the soul of the Hindustani populace, beyond the ambits of India and Pakistan. 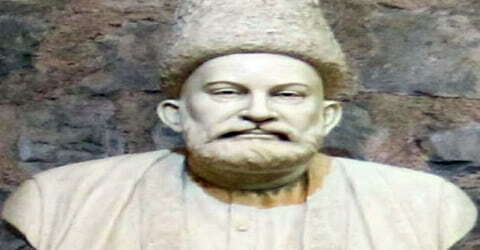 Most notably, Ghalib wrote several ghazals during his life, which have since been interpreted and sung in many different ways by different people. Ghalib, the last great poet of the Mughal Era, is considered to be one of the most famous and influential poets of the Urdu and Persian languages. Today Ghalib remains popular not only in India and Pakistan but also among the Hindustani diaspora around the world. Mirza Ghalib (Urdu: غاؔلِب‎), born Mirza Asadullah Baig Khan (Urdu: مِرزااسَدُاللہ بیگ خان), was born on December 27, 1797, in Kala Mahal, Agra, to Mirza Abdullah Baig Khan and Izzat-ut-Nisa Begum. His birthplace now stands as the ‘Indrabhan Girls’ Inter College.’ The room where he was born has been conserved. He used his pen-names of Ghalib (Urdu: غالِب, ġhālib means “dominant”) and Asad (Urdu: اسَد, Asad means “lion”). His honorific was “Dabir-ul-Mulk, Najm-ud-Daula”. Ghalib was a descendant of an Aibak Turk family, who, following the downfall of the Seljuk kings, had relocated to Samarkand, one of the oldest cities of Central Asia that is part of modern-day Uzbekistan. His mother was an ethnic Kashmiri. His paternal grandfather, Mirza Qoqan Baig, was a Seljuq Turk who had immigrated to India from Samarkand during the reign of Ahmad Shah (1748-54). He worked at Lahore, Delhi and Jaipur, was awarded the subdistrict of Pahasu (Bulandshahr, UP) and finally settled in Agra, UP, India. He had four sons and three daughters. Mirza Abdullah Baig and Mirza Nasrullah Baig were two of his sons. 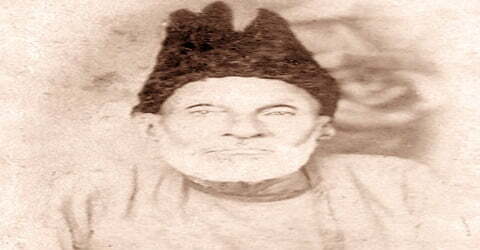 Ghalib’s father initially served the “Nawab” of Lucknow and thereafter, the “Nizam” of Hyderabad. He lost his father in the battle of Alwar in 1803 when he was five. Following the tragedy, Ghalib’s uncle, Mirza Nasrullah Baig Khan, took care of him. Ghalib learned Urdu as his first language while Turkish and Persian were also used at his home. As a young boy, he studied in Persian and Arabic languages. A tourist from Iran had come to Agra and had lived in his home for a couple of years. Ghalib was then in his early teens. Ghalib soon befriended the tourist, Abdus Samad (originally called Hormuzd), who had just converted to Islam. Under Samad, he learned Persian, Arabic, logic, and philosophy. At the age of thirteen, Ghalib married Umrao Begum, daughter of Nawab Ilahi Bakhsh (brother of the Nawab of Ferozepur Jhirka). He soon moved to Delhi, along with his younger brother, Mirza Yousuf, who had developed schizophrenia at a young age and later died in Delhi during the chaos of 1857. Before the onset of death, why should man expect to be free of grief? There are conflicting reports regarding his relationship with his wife. She was considered to be pious, conservative and God-fearing. His manners, including taking loans, borrowing books, drinking continuously, breaking norms, and gambling, often made him infamous. Ghalib earned the repute of being a “ladies’ man” in the Mughal court circle and was also incarcerated for gambling. The virtuoso, however, remained nonchalant and continued with his demeanor. On one occasion, when someone had appreciated Sheikh Sahbai’s poetry, Ghalib was quick to comment that Sheikh Sahbai could not have been a poet, as he had never drunk wine, never gambled, had never been thrashed with sandals by lovers, and had not even visited the jail. Born into an aristocratic family, Mirza Ghālib passed his youth in luxury. Subsequently, he was granted a small pension by the British government but had to struggle against penury and hardships. Recognition finally came in 1850, when he was appointed poet laureate to the last Mughal emperor, Bahādur Shāh II. Ghalib started composing poetry at the age of 11. His first language was Urdu, but Persian and Turkish were also spoken at home. He received an education in Persian and Arabic at a young age. During Ghalib’s period, the words “Hindi” and Urdu” were synonyms (see Hindi-Urdu controversy). Ghalib wrote in Perso-Arabic script which is used to write modern Urdu, but often called his language “Hindi”; one of his works was titled Ode-e-Hindi (“Perfume of Hindi”). Ghalib used to hold his Persian compositions in high regard. However, his Urdu “ghazals” have earned him more recognition among the newer generations. The purview of “ghazals,” which till such time had been predominantly restricted to the expression of heartbreak in love, was expanded by Ghalib. He included different subjects in his “ghazals,” such as the enigmatic aspects of life and philosophy among others. However, in most of his verses, he maintained the tradition of keeping the gender of the adored unspecified. In keeping with the conventions of the classical ghazal, in most of Ghalib’s verses, the identity and the gender of the beloved is indeterminate. The critic/poet/writer Shamsur Rahman Faruqui explains that the convention of having the “idea” of a lover or beloved instead of an actual lover/beloved freed the poet-protagonist-lover from the demands of realism. Love poetry in Urdu from the last quarter of the seventeenth century onwards consists mostly of “poems about love” and not “love poems” in the Western sense of the term. Many Urdu scholars elucidated Ghalib’s “ghazal” compilations. The first such work was by poet, translator, and scholar of languages Ali Haider Nazm Tabatabai from Hyderabad. The first complete English translation of Ghalib’s ghazals was ‘Love Sonnets of Ghalib’, written by Sarfaraz K. Niazi and published by Rupa & Co in India and Ferozsons in Pakistan. It contains complete Roman transliteration, explication, and an extensive lexicon. The fascinating letters of Ghalib, written in Urdu, have also given way for simple and popular Urdu, as before his time, letter-writing in the language used to be much more decorative. His way of writing was quite informal and sometimes humorous. His interesting letters gave the readers the feel of having a conversation with him. Ghalib’s prose pieces were also beautiful and simple, yet unique, and created a revolution in Urdu literature. His original Takhallus (pen-name) was Asad, drawn from his given name, Asadullah Khan. At some point early in his poetic career he also decided to adopt the pen-name of Ghalib (meaning all-conquering, superior, most excellent). At some places in his poetry, Ghalib also used the pen name of Asad Ullah Khan. In 1855, Sir Syed Ahmed Khan finished his scholarly, well researched and illustrated edition of Abul Fazl’s Ai’n-e Akbari. Having finished the work to his satisfaction, and believing that Mirza Asadullah Khan Ghalib was a person who would appreciate his labors, Syed Ahmad approached the great Ghalib to write a taqriz (in the convention of the times, a laudatory foreword) for it. Ghalib obliged, but what he produced was a short Persian poem castigating the Ai’n-e Akbari and, by implication, the imperial, sumptuous, literate and learned the Mughal culture of which it was a product. The least that could be said against it was that the book had little value even as an antique document. Ghalib practically reprimanded Syed Ahmad Khan for wasting his talents and time on dead things. Worse, he highly praised the “sahibs of England” who at that time held all the keys to all the a’ins in this world. Ghalib placed a greater emphasis on seeking God rather than ritualistic religious practices. Like many other Urdu poets, Ghalib was capable of writing profoundly religious poetry, yet was skeptical about some interpretations of the Islamic scriptures done by certain religious leaders. He staunchly disdained the practices of certain Ulema, who in his poems represent narrow-mindedness and hypocrisy. A large part of Ghalib’s poetry focuses on the praise and veneration of Muhammad, which shows that Ghalib was a devout Muslim. Ghalib wrote his Abr-i gauharbar (The Jewel-carrying Cloud) in honor of Muhammad. Ghalib also wrote a qasida of 101 verses in dedication to Muhammad. Ghalib described himself as a sinner who should be silent before Muhammad as he was not worthy of addressing Muhammad, who, according to him, was praised by God. Once, when the Indian rebellion of 1857 was in full swing, soldiers had dragged Ghalib to Colonel Burn for interrogation. This was on October 5, 1857, in Delhi. Bewildered by the Central-Asian Turk-style headdress he was wearing, the colonel asked, “Well? You Muslim?” Ghalib answered “Half?” The colonel asked again, “What does that mean?” Ghalib replied, “I drink wine, but I don’t eat pork.” His take on Hindustan is palpable from the poem ‘Chiragh-i-Dair’ (The Lamp of Temple), which he wrote on his trip to Benares, in the spring of 1827, and where he mused about the Indian subcontinent. Kulliyat-e-Ghalib Farsi”, an anthology of Persian poetry of well-known Urdu poet Mirza Asadullah Khan Ghalib first released at Maulana Azad National Urdu University (MANUU) and later released at Tehran by Ambassadors of India and Pakistan jointly at a function sponsored by Iranian Ministry of Arts and Culture in Tehran on 20 September 2010. This rare collection contains 11,337 verses of Ghalib, was compiled by Dr. Syed Taqi Abedi. Speaking at the occasion, Dr. Abidi said that the study of Ghalib would be incomplete without his Persian poetry. 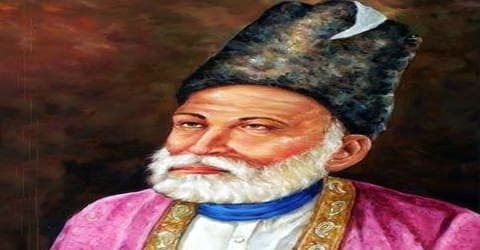 “Although Ghalib had earned his reputation in Urdu literature, the poet of Mughal era was more inclined towards Persian and produced high-order poetry in that language. At the literary “ru-ba-ru session” (Face to Face Sitting) organized by the Haryana Urdu Academy, where Dr. Taqi offered an analytical study of the works of legendary poet Mirza Ghalib, both in Persian as well as Urdu. He informs that Ghalib wrote 1,792 couplets in Urdu by the year 1865 as against the 11,340 in Persian. He also opined that Ghalib was a visionary, a poet of humanism whose works are popular even after three centuries. Mirza Ghalib breathed his last on February 15, 1869. He was buried in Hazrat Nizamuddin near the tomb of Nizamuddin Auliya. Mirza Ghālib’s best poems were written in three forms: ghazal (lyric), mas̄navī (moralistic or mystical parable), and qaṣīdah (panegyric). His critics accused him of writing in an obscure and ornamental style of Persian incomprehensible to the masses. His verses affirm God’s omnipotence while questioning the misery of the phenomenal world.